If you are looking for tank water heaters in Arlington, VA and the surrounding area, call Millie’s Heating & Air Conditioning. In addition to our expert installation services, we also provide routine maintenance and repairs for any style of water heater. Don’t hesitate to call us the next time you need any service for your tank water heater. The hot water needs of every home are unique, which is why there are so many different types, styles and sizes of water heaters to choose from. While this means that you can always find a water heater that is the right match for your home, it also means that there are numerous considerations that go into selecting a water heater. Tank water heaters have improved in efficiency and design over the years, and with the right one, you could save just as much on hot water costs with this style water heater. The technicians at Millie’s HVAC have extensive experience working with tank water heaters, and we offer a great selection for you to choose from. When you come to us for a tank water heater installation, our expert plumbers will work with you every step of the way to ensure that the product we put in for you is just the right fit for your home. We also offer a full range of water heaters repair and maintenance services designed to keep your hot water heater working properly over the long term. Because we understand that you need hot water for so many applications in your home, we get to your home as soon as possible when there’s a problem with your water heater, you need it fixed fast. We service all makes and models, and we specialize in tank water heater repair in Arlington, VA and the surrounding areas. Even if we did not do your initial install, we are always glad to do what we can to get your equipment running like new again. Just like any piece of home comfort equipment, your water heater will work better and last longer when it receives regular maintenance service from one of our professional plumbers. During a water heater maintenance service from Millie’s HVAC, we make sure to thoroughly inspect your unit and all supporting equipment to make sure everything is working as it should. These types of visits also allow our technicians to clean out any debris or sediment that has built up over time, make minor repairs, and replace worn out parts. All of these will help your hot water heater work more efficiently, which helps to save you money on monthly utility bills. 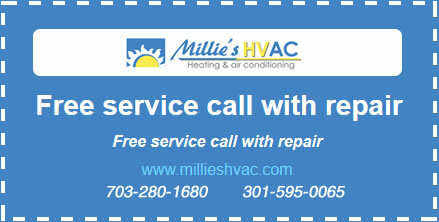 Call the Arlington, VA water heater specialists at Millie’s Heating & Air Conditioning the next time you need a water heater service. From installations to routine maintenance, we can do it all! Don’t go without hot water in your home. Call us for all your tank water heater service needs!